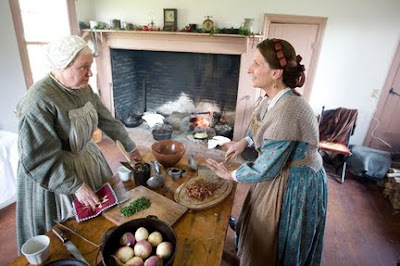 This past weekend my mother attended a living history event at Fort Hunter near Harrisburg, PA. She was one of the cooks in the summer kitchen on the property. I thought you might enjoy seeing a few pictures of authentic civilians cooking. Above is my mother, Nancy. These are my good friends Mark and Faith Hintzen. "Granny" Faith. Isn't Faith's knitted hood lovely? I'm sure that she purchased it at S&S Sutlers in Gettysburg. They have the prettiest knitted wool hoods and the color combinations are always beautiful. This is my friend Gaye Denlinger. Gaye always has the prettiest Civil War wardrobe. 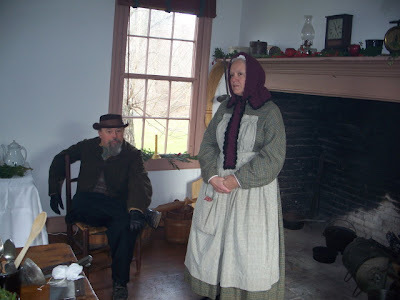 Her work dress and apron were made by Beth Miller of Gettysburg, PA. Her hair net was made by Beverly Lister of New Holland, PA. Beverly makes beautiful authentic bonnets, headdresses, and hair nets. Gaye helped me get started in reenacting and has always been an inspiration because of her dedication to authenticity. What fun! It looks like a lovely event.